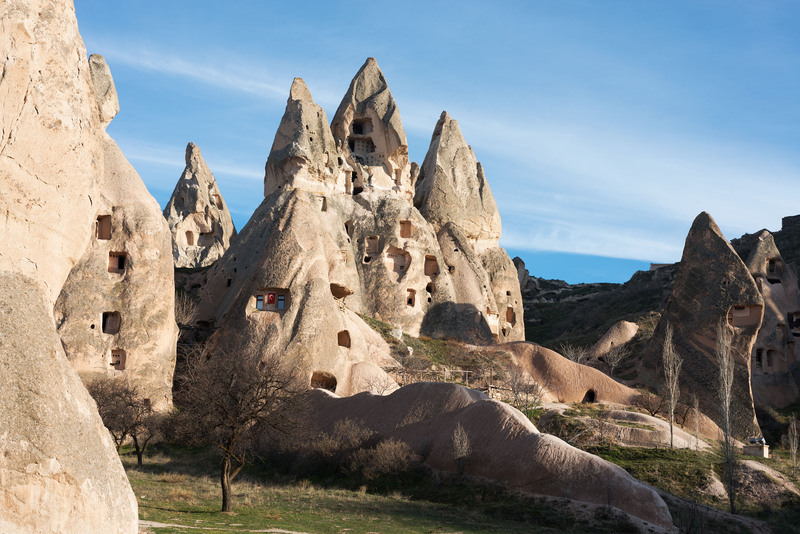 Anyone who suffers the charm of the landscape can only get excited in the fairy-tale scenarios of Cappadocia, the desert plateau in the center of Anatolia sprinkled with exceptional photographic opportunities. Join us in this experience that leaves its mark, letting you take the wind in a balloon flight at dawn. The desert plateau of Cappadocia, located at the center of the Anatolian peninsula, lends itself beautifully for the realization of a landscape photo workshop. The relatively small area is characterized by a geological history that makes its landscapes "lunar". The typical calcareous tuff that identifies it has undergone, over millions of years, intense erosion phenomena that restore its current and fascinating appearance. The nature of these places offers routes in an unbelievable landscape, strewn with rock formations of the most bizarre forms: the surprising "fairy chimneys", the memorable hoodoos. The incomparable panoramas of the Kapadokya, together with breathing different culture, traditions and life measures, will return a new dimension to those who decide to live this experience. As usual, a logistically perfect receptive structure was chosen, in the center of the shooting areas, in characteristic style and equipped with all comforts. An unforgettable dawn balloon ride is also planned, the authentic gem of this workshop, which will allow you to photograph the landscape from breathtaking shooting points. To fly. No difficult walks are planned. Possible easy walks in the nature for about 2 hours. Optional hot air balloon fly. 30% registration down payment by July 1, 2019. Day 1: 09/19/19 Arrival at Kayseri airport. Get the hired vehicles. Shooting. Dinner and overnight in hotel. Day 2: 09/20/19 Time to fly in hot air balloon! (Read the detail at USEFUL INFO). Back to the hotel. Lunch and photo revision. Afternoon shooting. Dinner and overnight. Day 3: 09/21/19 All of the day dedicated to shootings in selected areas. Dinner and photo revision. Overnight. Day 4: 09/22/19 All of the day dedicated to shootings in selected areas. Dinner and photo revision. Overnight. Day 5: 09/23/19 Breakfast and departure from the hotel. Scenic route with shooting on the road. Afternoon arrival at Kayseri airport. Return flights. FLIGHTS: Flights are left out of quota. Once the group is consolidated, a group flight solution will be proposed, which will be taken into consideration by the participants. The arrival and departure point is Kayseri Airport. In case of autonomous management of flights, exact times and places will be indicated to meet with the group. VEHICLES: A self-drive formula is proposed, which allows a substantial reduction in costs. Where necessary, some participants will be asked to make themselves available to the guide, with a display of a credit card as a guarantee. In the absence of volunteers it will be necessary to provide local drivers, with a considerable increase in the final cost of the tour. The option vehicles are covered by CDW insurance. Withdrawal of the vehicles will be evaluated the extension of insurance coverage for accidental damage, verifiable only on site. HOT AIR BALLOON TOUR: it is possible to choose a morning tour (hotel pick-up one hour before dawn, flight time 1 - 1.30, return to the hotel late morning, at the approximate price of € 150, out of quota). Consolidated the group will proceed to collect the adhesions. The trip price provides for a double room treatment. A request for a single room accommodation, considering the limited vacancies, will be managed with a chronological request order and implies this supplement. The participants will always be assisted in searching for a roommate. If there are no availabilities, you will be promptly informed, and the fee from a double to a single room will change accordingly. The price of the trip is calculated on a 6 participants basis. In the case in which the minimum quota is not reached, the participants will be offered a remodulation of the price, for a reduced group of 4-5 people. The down payment implies a commitment to participate to the workshop, which is coordinated by 4Winds tour operator. Here the cancellation policy. What described above is the planned trip program. We reserve the right to modify it in case of sudden events beyond our control. The reported details on these pages could be subject to change and discounting without notification. We reserve the right to cancel the tour in case the minimum number of participants is not reached. For reasons beyond our control, as tax variations and/or tax percentages variations, we reserve the right to update the trip price. All participants have to take the trip in good health conditions and must be able to carry their equipment autonomously during the walks. Participants are asked to wait for the reconfirmation of the trip before proceeding to book flight tickets.